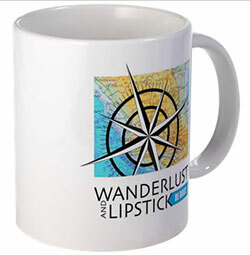 Spiritual Category Winner in the 2013 WanderWomen Write Travel Writing Contest!Â Shara wins aÂ Briggs & Riley TORQÂ Carry-on bag. It was chilly but pleasant enough as my husband and I sat on the rooftop drinking local beer and Tibetan tea – a tall glass filled with leaves, sticks and berries, and things that looked like rocks. Below us, as the sun set behind the walled city of monks, local artisans and sellers packed up their goods from the ground and rolled them into large blankets for overnight storage. The sprinkling of tourists was thinning; they headed inside for dinner, as we had done. But a steady stream of the humble, the seekers, continued around the monastery’s perimeter along the Pilgrim’s Way, turning prayer wheel after prayer wheel. Scattered up the mountainside above the monastery walls were small, white-washed hovels where monks secluded themselves for solitary meditation. One man after another, lifetime after lifetime. I wondered how many of them were fading into darkness alone with their chalice of silence while I drank my bottle of beer. 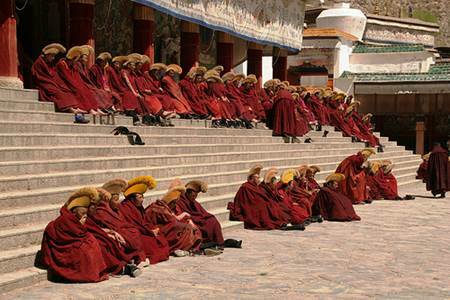 The Labrang Monastery in central China is the most populated of the Buddhist Yellow Hat sect – the sect to which the Dalai Lama belongs. Red-robed men and boys fill the streets in Xiahe, the small town built around the monastery, their tennis shoes sticking out from beneath the folds of traditional cloth, and cell phones in nearly every pocket. 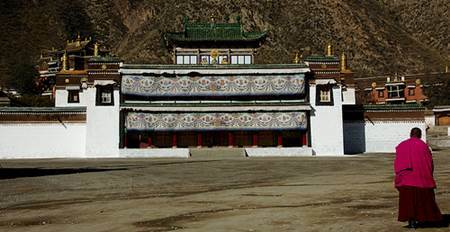 Inside Chinese-occupied Tibet, the Chinese government has instituted caps on how many monks can reside in any one monastery, fearing the potential for revolt. 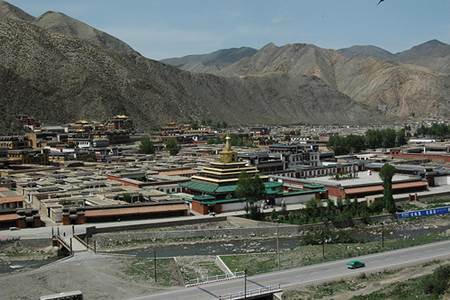 However, Labrang is inside China proper, high in the mountains of Gansu Province in the Gannan Tibetan Nationality Autonomous Prefecture, so it is notÂ subject to this cap. Built in a crook of the icy-cold Daxia River 300 years ago, it sits at the foot of Phoenix Mountain, facing Dragon Mountain, the perfect portrait of Chinese iconography – the phoenix and the dragon. 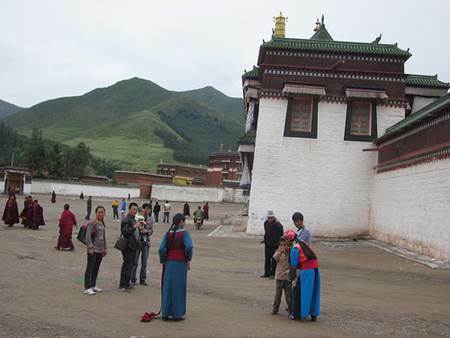 Large Tibetan monasteries like Labrang are not solely compounds for meditation and spiritual contemplation. They are, in fact, like universities. Labrang has six colleges. The nearly 1,400 resident monks can choose a specialized education in any of these colleges that represent the cultural continuity of traditional Tibetan knowledge. But underlying and suffusing everything at the lamasery is the dedication to the Buddhist doctrine and practice. Walking through the large, dimly lit meditation hall, I tried to imagine what it must smell like when the long rows of cushions on the floor are filled with close-shorn men seeking enlightenment from within their own intuition and self-reflection. A series of skylights and high windows allow natural light into the hall, but it’s absorbed by the rich-colored draperies and circular banners. The heavy material bulges with the weight of the light spectrum, leaving the air thin and anemic. The various side rooms that hold statues of Buddhas and other deities have no windows; the Buddhas and bodhisattvas, cast in smooth, silky gold, sit on the cusp of light as if they have just been born into a new world, as if light is still being formulated, the calculation begun but not finished. Despite the elaborate gold work inside these windowless rooms — a trove of visual brilliance — the niches are solemn, hushed into austerity. To stand quietly in these dim inner recesses borders on the magical. The Buddha is illuminated by tiered rows of shallow golden dishes, each holding aloft a golden, oblong flame on a pool of clear yak butter. The air is heavy, and the flames flicker in this dusky atmosphere with an ethereal clarity, licking the dim light as crisply as if they were hand-bells piercing a deep silence. Nearly two miles above sea level, even in the middle of summer, any air not directly warmed by the sun carries a chill. 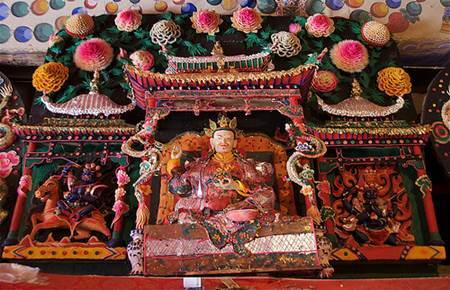 The air is cool enough year-round to support the monks’ yak-butter sculptures, which remain solid inside an exhibition room until, at year’s end, the butter is melted in a ceremony and new sculptures created. While we were there in August, all the nooks and crannies and pockets of shade reminded us that we were inching toward the top of the world. I had put on as many layers of clothing as I could fit — T-shirt on top of T-shirt, pants on top of shorts — and yet I shivered at dinner, at tea, in our hostel room. And particularly while trying to take a shower, an adventure I decided to embark upon the second morning of our stay in Xiahe. I was alone in the shower room, which consisted of three large, square shower stalls with thin curtains. I took the middle one, peeled off the layers of clothing I’d worn to bed, and stood naked in my rubber shower sandals while water fell from the pipe above my head onto the cement floor. It was ice-cold. I figured there must be a significant length of pipeline the heated water would have to travel before reaching my shower stall, so I huddled in the far corner where the water couldn’t touch me, and waited for a sign of steam. glanced at my watch from time to time to monitor the second-hand creeping across the numbers. I was now a painting separate from myself. Rather than being inside the stall with my eye looking at the walls and the water coming out of the pipe, I saw the whole scene from outside and above, as if looking down into a diorama. The scene was ghostly: my pale, blood-starved skin inside the gray cement stall, white breath, icy-clear water. I was a plastic doll in the corner with a dollop of red paint on my feet – the pair of red rubber sandals I had bought for two bucks at a Yulin City grocery store the previous year, when I had first come to China. I stared intently at them; for they were the only suggestion that color existed in the world. I focused on them as though they alone, in their redness, could summon heat to infuse the water. I struggled to move toward my clothes, which were hanging on a peg next to the curtain. Like a sleepy sloth, I took two steps and extended my arm to brush weakly at them. Behind my chattering teeth, a taste of sulfur suddenly rolled down my tongue, and I perceived a sign of warmth in the water. I stood still as the water grew warmer and warmer, until finally it sputtered steam into the crisp air. Overtaken with relief and joy, I fell back inside the scene, my sandals squishing in the water as it hit the base of my neck and streamed over my shoulders, down my back and chest, following the contour of my legs down toward the red, bouncing off my rubber feet and splashing onto the floor. Finally clean and reasonably warm, I dried myself, got dressed, then went to wake my husband. We went down to breakfast at the hostel dining room next to the lobby. Afterward, crossing the courtyard back to our room, we came upon a tiny tractor emptying a load of coal in the corner of the yard. A bucket brigade of women handed the large, black, angular chunks of coal to each other down the line until they reached the furnace room, where a sweaty man with a large poker stirred the yellow-hot coals in the open furnace and made room for the new chunks as they were dumped in. I thought back to my shower and widened the aperture to see beside my cold, huddled body a line of women dressed in blue, handing over coal into a raging fire. There was no little switch. While I had waited in intense cold, somebody had been working in intense heat trying to reach me. 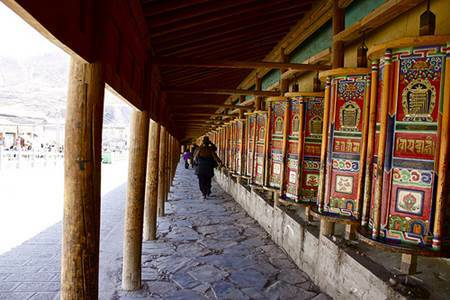 The Pilgrim’s Way is a covered corridor nearly three kilometers long that encircles and encloses the Labrang lamasery complex. The entire length of it is lined with prayers wheels, each one five feet tall and over a foot in diameter, mounted upon a continuous cement shelf a couple of feet high. The four handle-poles of each wheel are painted bright orange on the top half; in the middle they are gray-black with the grime built up from countless human palms gripping them; the bottom third is bare wood, the paint having eroded over the years from the brush of clothing. The square-sided cylinders themselves are painted with geometric and iconic images in orange, blue, green and gold; the Buddhist mantra om mani padme hum is lettered in gold on each of the four sides in the ancient Indian Ranjana script. Thick lines of black oil stream down the cement from the bottom of each prayer wheel, as they are turned so often they need to be oiled constantly. This was the primary reason I had chosen to come to Xiahe as part of my journey through China: I wanted to see a sacred place; I wanted to see the “pilgrims” and their prayers spinning on wheels. I don’t have this spirituality myself, so I like to watch it in other people. As my husband and I sat on a rooftop drinking our beer and tea in the evenings, I studied them all from afar as they grabbed a wooden pole on each wheel and set it spinning clockwise, hurling the painted words, om mani padme hum, into the air like a whirling dervish. The majority of the pilgrims were ethnic Tibetans. 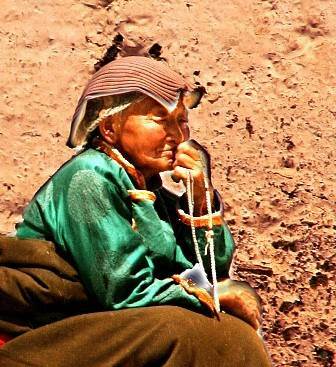 Old women, with silver hair hanging in braids down to the small of their backs and tied together at the ends, shuffled down the streets and along the Pilgrim’s Way, turning the hundreds and hundreds of prayer wheels. 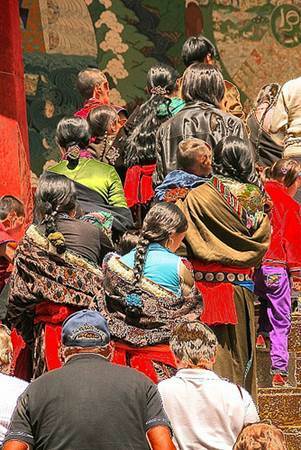 Old men in tall, padded felt boots made their way around, too, along with elderly Tibetans who limped and hobbled with crutches as healthy monks in red robes wove in and out among them, the perpetual procession like a wave in motion across a boundless sea. Outside the south corridor of the Pilgrim’s Way, near the river, a man had consigned himself to some enormous number of kowtows. In order to keep doing them without bloodying his palms and knees, he knelt on a small padded mat and had outfitted his hands with little skates, strips of smooth wood with four wheels on the bottom, strapped to his palms. So when he put his hands on the ground after kneeling, he could roll his hands out in front of him until he was prostrate, and then roll them back to his kneeling position, from which he stood up and began again. He was there all day, as we passed by him occasionally in our meandering. How many days had he already spent there, and how many more would he? He was not a young man by any means. As I watched him, I felt conspicuous and irreverent, a gawker, but the man had no notion of anything going on outside the length and breadth of his own body. Chanting in an earnest mumble, his mental focus was tangible. The kowtows passed the time while he concentrated on his mantra. His heart was beating inside his mouth, pumping blood through the veins of his words. 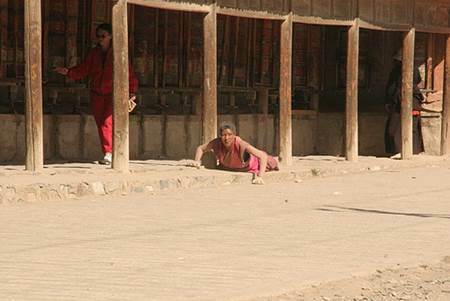 Many of the pilgrims at Labrang make an excruciating three-kilometer journey around the Pilgrim’s Way, prostrating themselves over and over every few steps. This humble sincerity of prayer was almost embarrassing to watch. I felt curiously hollow as a witness. The thing about spirituality today in a place like China that makes it utterly different from its practice in a place like America is that many of our Christians, and even our Buddhists, can financially afford insincerity and hypocrisy. Few things, if any, have humbled them to a state of unbounded sacrifice. They have the luxury of being indifferent to things that other people desperately want and more desperately need – not just nonessential things such as a chance to acquire even a rudimentary education at a rural primary school, or of more important things like having health restored by miracle rather than money, but need of the most basic of necessities required to lift one out of demoralizing poverty: a pair of shoes, a well with water in it, enough food to keep from selling a child. I have this privilege also. I turned the prayer wheels primarily for the novelty of it, though I summoned a simulation of spirituality to the surface to grip them with. I don’t normally have much to pray about. For me, spirituality is an academic reflection on the nature of our existence. But the man with the hand-skates particularly touched me. I couldn’t let go of him, though he was not unlike others. 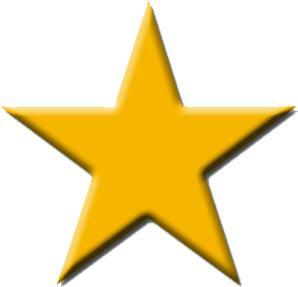 I knew this man, or I began to know him, or I remembered having once known him. At first I worried I hadn’t suffered enough yet in my life to know him — I was snagged on the notion of time, of duration, but time measures nothing; it is merely a construct defined as that which we measure: minutes, hours, days, eternity, simultaneity. I shivered in a shower stall during the same time the man kowtowed with his skates; I was separated from him by fathoms — by vertical depth — not by hours, trailing the horizontal arrow of time.